In a world where networking services are increasingly being provided by service overlay networks, management of these services at overlay level is becoming crucially important. 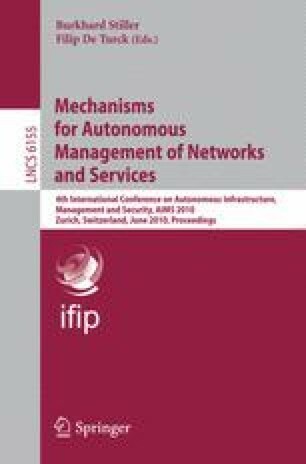 This paper presents an architecture for services management in P2P Service Overlay Networks (SON). The architecture, named OMAN, takes into account the formation of the P2P SON comprising several different service providers belonging to several different network domains. It uses P2P mechanisms to provide service search and service self-improvement through the monitoring of the P2P SON overlay and self-configuration. Preliminary results concerning service aggregation and service searching are presented in this paper, giving an insight into the expected benefits and providing proof of concept as well as pointing the overall potential of the OMAN architecture. This work was partially funded by FCT (scholarship contract SFRH/BD/ 45683/2008).